Completely portable! You supply the water, we will supply the fun. Comes with 3 softballs to throw at the target. 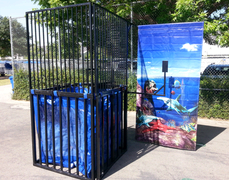 The tank has a window to view the person being dunked. Can set up on grass, concrete, asphalt, dirt or grass. Can be used as a great fundraiser.